Henry Holt and Co., 9781250131560, 320pp. A shirt-grabbing, page-turning love story that follows a one-of-a-kind family through twists of fate that require nearly unimaginable choices. Happiness begins with a charming courtship between hopelessly attracted opposites: Heather, a world-roaming California girl, and Brian, an intellectual, homebody writer, kind and slyly funny, but loath to leave his Upper West Side studio. Their magical interlude ends, full stop, when Heather becomes pregnant—Brian is sure he loves her, only he doesn't want kids. Heather returns to California to deliver their daughter alone, buoyed by family and friends. Mere hours after Gracie's arrival, Heather's bliss is interrupted when a nurse wakes her, "Get dressed, your baby is in trouble." This is not how Heather had imagined new motherhood – alone, heartsick, an unexpectedly solo caretaker of a baby who smelled "like sliced apples and salted pretzels" but might be perilously ill. Brian reappears as Gracie's condition grows dire; together Heather and Brian have to decide what they are willing to risk to ensure their girl sees adulthood. The grace and humor that ripple through Harpham's writing transform the dross of heartbreak and parental fears into a clear-eyed, warm-hearted view of the world. Profoundly moving and subtly written, Happiness radiates in many directions--new, romantic love; gratitude for a beautiful, inscrutable world; deep, abiding friendship; the passion a parent has for a child; and the many unlikely ways to build a family. Ultimately it's a story about love and happiness, in their many crooked configurations. Heather Harpham has written six solo plays, including Happiness and BURNING which toured nationally. Her fiction, essays and reviews have appeared in MORE Magazine and Water~Stone Review. Harpham is the recipient of the Brenda Ueland Prose Prize, a Marin Arts Council Independent Artist Grant and a grant from the Barbara Deming Memorial Fund. She teaches at Sarah Lawrence College and SUNY Purchase and lives along the Hudson River with her family. 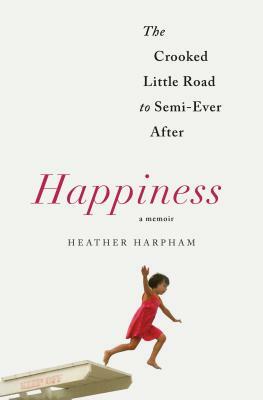 "Harpham. . . .[brings] us along on her raw, real journey of healing—not just of her child but also of her marriage." —Oprah.com, "5 Memoirs That Will Blow Your Mind"
"Absorbing. . . .A beautifully-written, insightful tale." —Good Housekeeping, "The 21 Best new Books for Summer 2017"